The Hall Green pugilist says he is now mentally and physically prepared to show his potential to a global audience with a World Welterweight Championship fight right here in his native Birmingham in the New Year. The former English World Champion, who brought Commonwealth Gold glory to the city in 2006, will face African Bethuel Ushona in front of a packed Genting Arena in the Now Or Never clash on Friday February 23. Gavin said:’ “That’s it – no more Fun Time Frankie – this is my last real big chance at a world title shot – the one big title that has eluded me and I’m not about to blow it. And so determined is the 32-year-old to make this last shot his best one that he says he is resigned to avoiding Christmas and all the traditional seasonal celebrations in a bid to be super fit for his fight. He added: “I know a bit about my opponent and he has an impressive record in Africa on the big stage He’s a tall guy with long arms so he’s going to be a tricky opponent. Gavin will announce his title shot to fans pitch side at Birmingham City’s St Andrew’s ground on Saturday afternoon ahead of the Championship clash with Queen’s Park Rangers. The boxer is a lifelong Blues fan and says parading his ambitions before the game will be a huge incentive. Promoter Errol Johnson, Head of Boxing at Black Country-based BCB Promotions who are putting on the fight together with Redditch-based show sponsors BWI Events, said: “We are delighted to be working with BWI on such a major event. 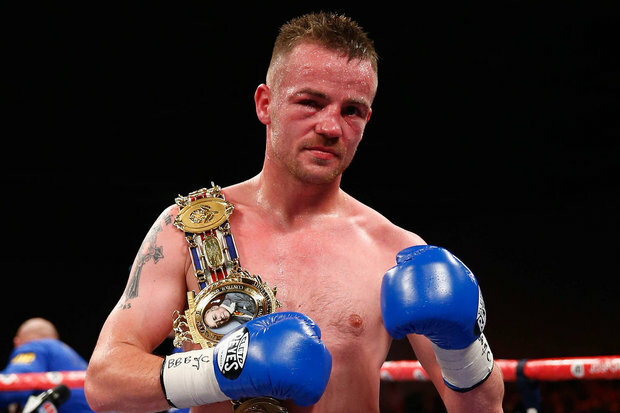 “Frankie Gavin is one of the biggest boxing names the Second City has ever produced. “He is immensely talented. He is England’s most decorated amateur and has held British and Commonwealth titles as a professional. This is a chance for him to claim the IBO Welterweight Title and really push on from there. The show, at Birmingham’s prestigious Genting Arena, will also feature an impressive undercard boasting major local talent. Joining Gavin is fellow Brummie, Sean Davis. The former WBC International Super Bantamweight Champion recently challenged Thomas Patrick Ward for the British Title and will be looking to get back in title contention in 2018. Redditch’s Andrew ‘D’Animal’ Robinson. The former Midlands Area Champion has his sights firmly set on domestic and International honours in the New Year. Undefeated Wolverhampton bantamweight, Kyle Williams, also features. The former world kick boxing champion has made light work of his opening seven opponents since switching disciplines and is sure to be in title contention himself in 2018. Newly crowned IBO Continental Welterweight Champion, Craig Morris, appears. The 25 year-old defeated Ryan Martin earlier this month to claim the strap. Tipton light heavyweight, Ricky Summers, will be looking to get back in domestic title contention after a narrow points defeat against British Champion, Frank Buglioni, earlier this year. Summers returned to winning ways last month with a points victory over durable Spaniard, Romero Gonzalo.